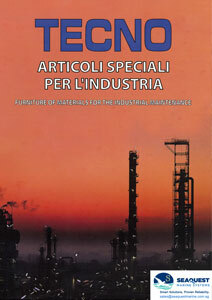 Tecno has successfully operated in the supply of materials for industrial maintenance since 1990. Over these years tecno has amassed a wide and diverse product range (finished and unfinished) to provide an effective solution to all industrial needs. From cutting and grinding implements to welding structures, Tecno is the one stop shop for your material needs. Copyright 2019 Seaquest Marine Systems. Sitemap. Netbiz Web Design by NetBiz Enterprises.